Veterans often encounter unique obstacles when considering entering into farming. There are over 800,000 military veterans in New York State, but they exist in a dispersed population, varying from 3-15% of the total population of each county. Because they do not have a dominant presence in any one location, specialized resources are often lacking, ultimately presenting a high barrier to entering agricultural jobs and further marginalizing these veterans. Agriculture is not directly supported by Veterans Affairs – veterans cannot use education funds for most farm training and often cannot use vocational training funds for farm related occupations. In addition, many veterans have unique disabilities (e.g. amputations, PTSD) and training and resources need to include mechanisms to address these issues. Over the last two years, the Northeast Beginning Farmer Program has begun receiving an increasing number of requests each month from veterans seeking assistance. Want to receive news about the ‘Farm Ops’ programs for Veterans in ag? Click here to sign up for enews and be sure to check the ‘Veteran’ box when you sign up. 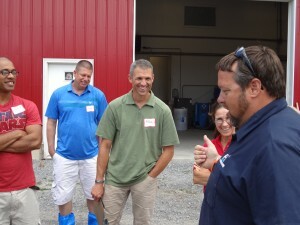 Through a grant from the USDA’s Beginning Farmer and Rancher Program the Cornell Small Farms Program initiated a statewide service provider network for organizations to support agriculture training for veterans. In continuing this work, we plan to implement multiple education strategies to engage and train military veterans who want to farm. We will be using this listserve to communicate with you as we begin to implement initiatives across the state. In turn, we hope you will use this as a tool to let others in the state know about events and training opportunities or discuss issues which would be relevant to veterans in agriculture. Who’s Part of the Network? From the email address you’d like to use for your list subscription, send an email to NYVETSAG-L-request@cornell.edu and type the word “join” (without quotations) in the body of the message. Farm OPS strives to provide access to resources and training events for veterans pursuing careers in agriculture in New York State. With funding from the New York State Department of Agriculture and Markets, we currently are offering scholarships to veterans and active duty military personnel who attend educational events and workshops. The program currently offers up to $100 in reimbursement on eligible costs for agricultural trainings on a first come, first serve basis, while funds are available. At this time, eligible costs include travel expenses and registration for trainings (i.e. hotel, mileage, event registration). To learn more about this opportunity, and determine if you are eligible for a scholarship to a specific event, please contact Dean Koyanagi by email or at 607-255-9911. Should the event be eligible, you will be asked to complete and return a travel reimbursement form, copies of receipts, and an event evaluation form. Please note that reimbursements are based on actual expenses, up to, but not automatically totaling $100. Intensive, several-day training events may be eligible for a higher reimbursement rate. Through this program the Cornell Small Farms Program is also pleased to offer partial scholarships for military veterans to take our online courses. The courses, normally $250, will be offered to veterans for $125. In order to be eligible a person must be a veteran or active duty military, a resident of New York State, and have plans to begin selling farm products (filing a Schedule F) in 2017 or 2018. The course offerings and schedules can be viewed here. If you are eligible and would like to apply for a scholarship, contact Erica. Registration is limited and will be offered first come, first served. Participants will be asked to complete a targeted survey at the end of the course as well as 6 months from completion, to determine the effect on their operation. 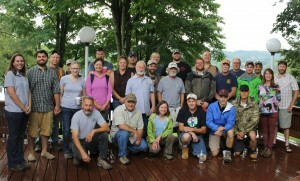 As part of our educational programming, the National Center for Appropriate Technology (NCAT) delivered their ‘Armed to Farm’ program to NY farmer veterans in 2015, 2016, and 2017. This program provides an intensive, week-long residential business and entrepreneurship training for veterans interested in farming. ‘Armed to Farm’ has been tested around the country and evaluations by veterans who have participated in the program are exceedingly positive. 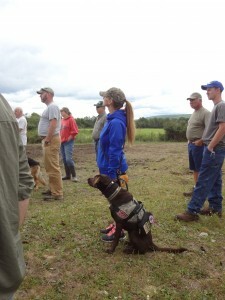 The third and final Armed to Farm for veterans in NY took place in Queensbury from July 31 to August 4, 2017. To learn more about training opportunities, please be sure to sign up for our E-news updates and check the ‘Veteran’ box to be added to our veterans in ag. listserve. Working with our partners in Cornell Cooperative Extension and other regional leaders, we will create farmer-to-farmer learning groups for veterans to gather, prioritize educational goals, learn from each other, and develop mentoring relationships with other farms and organizations available to support their goals. Interested in networking with others on social media? Consider requesting to join the NYS Veterans In Agriculture Facebook page. This group is for farmers, veterans, and service providers who are interested in the discussion of how to better support veterans and active duty personnel transitioning into agriculture. Another opportunity to connect is through the Farmer Veteran Coalition. 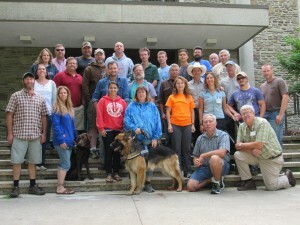 You can follow the New York chapter of the Farmer Veteran Coalition on Facebook at FVCNY. 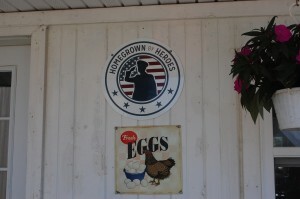 Host a Veteran through On-the-Job Training on YOUR farm! Project staff are working with the New York Division of Veterans Affairs as well as other state agencies to identify five NY farms that are willing and can be approved to to provide on-the-job training (OJT) opportunities for veterans. Achieving approval for this is not a lengthy process and could allow veterans to access OJT/apprenticeship funds provided by VA/GI benefits. Traditionally, OJT has been focused on trades but this novel strategy will link traditional VA support to agricultural training. If you are a farmer interested in hosting a veteran employee for on-the-job training, please contact us and we will be happy to explain the process to you! Or contact Project Coordinator Dean Koyanagi by email, or call 607-255-9911. This work is supported by the New York State Department of Agriculture and Markets.